For unique Thanksgiving craft ideas, try these fun little Turkey Napkin Rings that your guests will love as they sit down to feast. Enjoy the ease of thanksgiving crafts from The New Image Group. Add these adorable Thanksgiving crafts to your tablescape this November. Whether you are creating these DIY napkin rings for the big kids table or just want to give the little ones a craft to create and play with, these gobble guys are sure to be a hit. 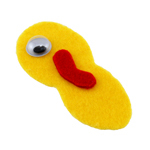 Using just a few pieces of felt and some googly eyes, this craft project idea will only take 5 minutes to make one, allowing you to create them in bulk if need be! Find the rest of our Thanksgiving craft ideas in our long list of charming ideas, 200+ Thanksgiving Crafts for Kids and Adults. This collection include more Thanksgiving kids crafts, DIY table decor, centerpiece ideas, and more. 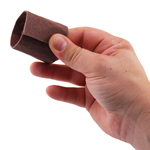 Fold the Brown Napkin Ring into a circle with 3/4" overlap. Glue into place. TIP: We use paperclips to keep our crafts in place while drying! While the napkin ring is setting, let's create our Turkey's face. Layout desired location for the google eyes and wattle. Glue into place. Let dry. Glue the feathers to the back of your napkin ring. Glue your turkey's face to the front of your napkin ring. Oh my are these not a great project for the kids to do for the Thanksgiving dinner. These turkey napkin rings are a great way to show your guest where to sit. Put their name on the ringwith marker or glitter. You can add a bow tie or maybe even some real feathers for an added touch. Downloadable pattern too. These napkin rings are adorable. My kids would love this easy project. We can use these on Thanksgiving. Made these last year for Thanksgiving. They are very simple to do and everyone loved them. I like it, its fun, great look and easy making.